Charlie Campbell, ahead of Don Robinson Circus, reports a resident of Ray City, Ga., has some large bones reputed to be from an elephant, Gypsy, executed there while with the Harris Nickel Plate Circus in 1901. Gypsy the elephant was actually killed in Lowndes County near Cherry Creek in 1902, after trampling her trainer and escaping from the Harris Nickel Plate Circus. She was shot by Valdosta Police Chief Calvin Dampier. In the ensuing days more than 3000 people came to see the dead elephant. Virtually from the instant of her execution, there was talk of preserving Gypsy’s skeleton. Eyewitnesses reported that some visitors took trophies and souvenirs from the body of the slain pachyderm, before the 12,000 pound carcass was finally hacked apart and burned. Did the bones of Gypsy the elephant eventually make their way to Ray City, GA? 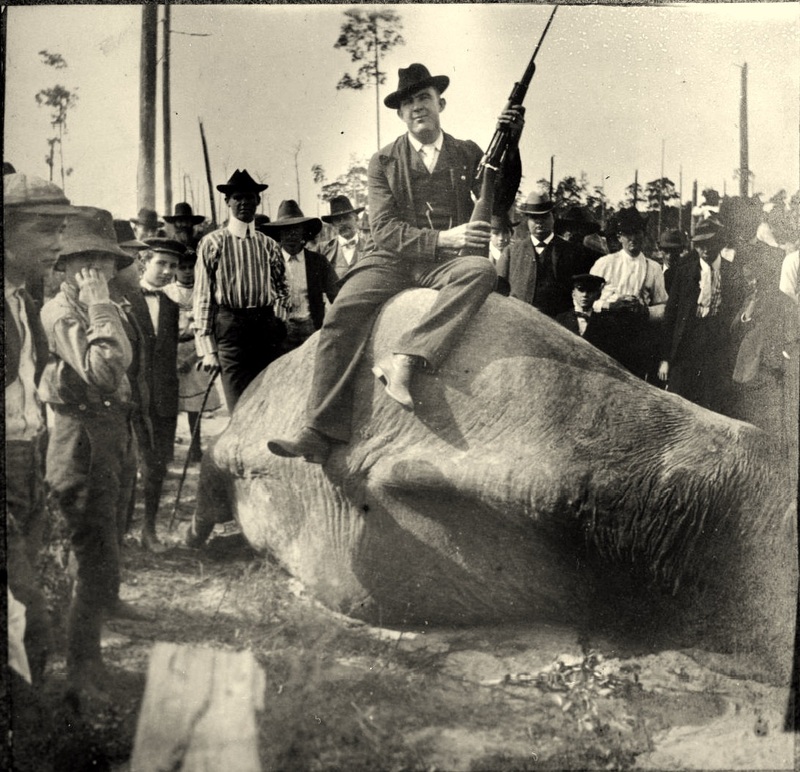 Valdosta Police Chief Calvin Dampier used a borrowed Mauser rifle to bring down the rampaging elephant, Gypsy, in November 1902. The tragic events that occurred at Valdosta, the trampling death of James O’Rourke and the execution of the beast he trained were almost inevitable given the bloody history of Gypsy the Elephant. Even the circus train’s travel to Valdosta, GA, foreshadowed the impending doom awaiting them at their final destination. On October 28, 1902 two cars of the Harris tNickel Plate Circus train were derailed at Dothan, AL According a a lawsuit filed by the circus owner, the two derailed circus rail cars were broken to pieces, the circus wagons loaded on the rail cars were broken and smashed as were the tent poles, seasts and canvas. The wagon known as the “bank wagon” and the “lion den” was turned over and demolished. One of the lions died from injuries and another was crippled. As a result of the accident, the circus was forced to cancel its engagement at Bainbridge, GA but was able to resume travel to its show in Valdosta. As the circus and menagerie were in route the Harris Nickel Plate Circus train was wrecked at Tifton, GA in a collision with another train. Several of the show people were injured. Another show wagon was demolished, one of the largest and heaviest in the troupe. One of the show’s finest ring horses was crippled and had to be put down. Surely the show people were relieved to reach Valdosta, which was to be their season finale’. 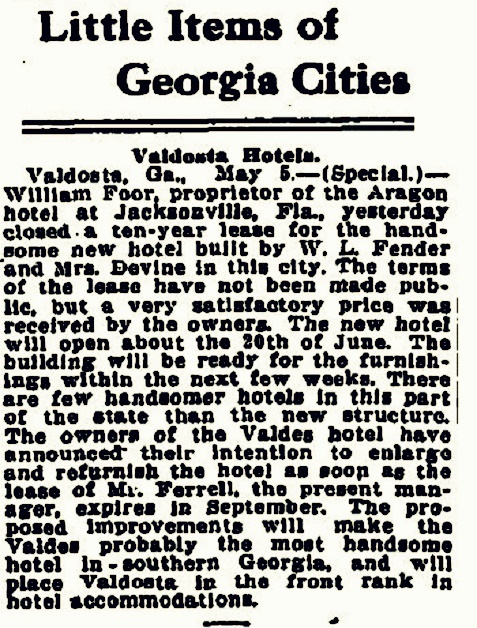 After the Valdosta performance, the show people would winter over in the town before resuming their exhibition circuit in the spring. ELEPHANT GYPSY GOES WILD AND IS KILLED NEAR HERE. After Terrorizing the Business Portion of the City, she Dashes out to Pine Park and was Shot Down Six Miles Above the City Sunday Morning. Valdosta experienced a sensation Saturday night such as no other city in the country has ever witnessed. It was a chase by scores of people after a monster five ton elephant, which had trampled its keeper to death and was standing in defiance of all who should come within reach. After a chase lasting all night long and far into Sunday morning, the big brute was killed by Chief of Police Dampier, six miles above the city, with a single shot from a Krag-Jorgensen rifle. The anima had been shot dozens of times in the past, and this is said to have been the first animal of the kind ever killed with a rifle ball in this country. The elephant belonged to the Harris Nickel Plate Shows, which gave two performances here Saturday and which broke tents that night to go into winter quarters at Pine Park. The animal was named “Gypsy” and she had been seen many times in this city. She was one of the largest elephants in the world. The show was here for two weeks during the State Fair and gave two performances daily, the acts by “Gypsy” being features of the performances. The show went from here to Lake City for two performances and then visited Macon, Cordele, Tifton, and other places along the Georgia Southern road, returning here Saturday morning for the last two performances of the season. The big beast was in charge of James O’Rourke, who seemed to have her under perfect control. She was an exceedingly intelligent anima and her acts in the circus ring were the cleverest ever witnessed here. Among them was the blowing of a harmonica. Gypsy being the only elephant in the word which had been trained to blow a wind instrument of any kind. At O’Rourke’s command, the elephant kneeled down and he crawled up on her head and then he gave the signal for her to move on. 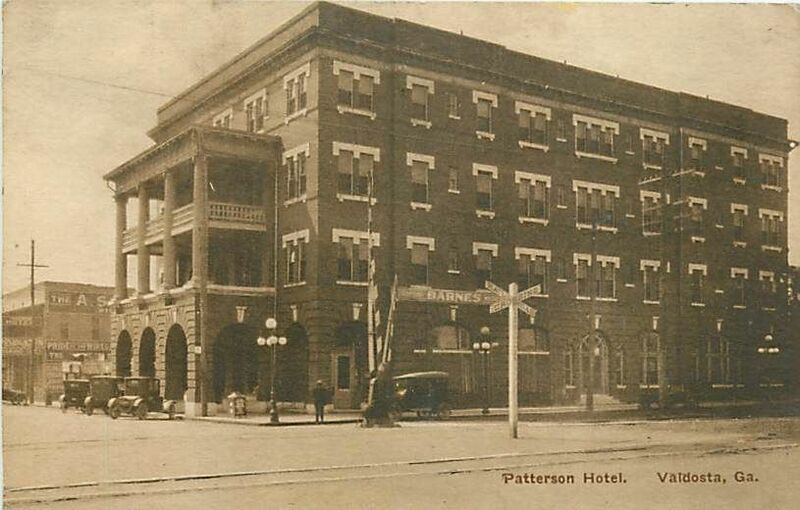 The great beast started off from the show grounds east of the city hall, toward Patterson street and thence to the Georgia Southern passenger depot where O’Rourke expected to get a change of clothing to put on. He remained at the circus cars a short while and started back up town along Patterson street, turning at Hill avenue toward the show grounds, but turning again at Ashley street toward Central avenue. The showmen say that the elephant expected to go in the car at the depot and when she was brought back up town it angered her. The turn at Ashley street was made and Gypsy ambled along toward Central avenue, where a turn was made to the left, leading toward Patterson street, but crossing that street and continuing the slow pace toward Toombs street. A number of parties on the street called out to O’Rourke and told him that he was going the wrong way, but he paid no attention to them. Chief Dampier was sitting at his stable when the elephant passed there and he called O’Rourke’s attention to the fact he was on the wrong street, but a mumbled answer came from the man on the elephant’s head, and the chief supposed that he wanted to go a side street to get out of the way of the vehicles and street cars on Patterson street. Two young men, Smith and Christian, followed the elephant from Patterson street to Toombs and were close to her when O’Rourke fell off of her head. They stated that the elephant stopped a moment as if to wait for him to resume his position, but a moment later she kneeled down over him and crushed every bone in his body, rolling the limp body along with her trunk and tusks for probably fifty yards. She then turned toward the side of the street and began grazing on the grass there as if nothing had happened. Chief Dampier heard her crushing O’Rourke and ran over close enough to see that he could do nothing for the man. He then went to the circus and informed the managers of what had taken place. In a short while the entire circus force was on the ground trying to control the animal, while Manager Wilson and Sheriff Passmore were trying to get the crowds to stand back. One of the clowns , Barney Shea, who was formerly her keeper, undertook to lead her toward the depot and place her on the cars there and it was believed that he would succeed, as the animal knew his voice and followed him nearly to the Plant System depot. In the meantime, a large crowd had gathered and excitement was running high. A train was stopped on the crossing where the elephant was to pass and this, together with the excited crowds, seemed to rattle her. She turned back toward the Christian church, from which some of the members of the circus were calling to her in “elephant talk,” but it was apparent that she was getting thoroughly aroused. She grabbed an electric light pole with her trunk and shook it until the lights flew out all along the street. Then, she began to hurl bricks and pieces of timber through the air. Billy Mincer, another of the clowns in the circus, was hemmed in a rear door of the new Christian church but was pulled out and hurled some distance of the angry animal. She started to renew her attack upon him but he was pulled out of the way by some parties who were near by. He was in an unconscious condition and was carried to the Valdes Hotel for medical. In the meantime Barney Shea and Clem Kerr, the latter being the advance agent of the circus, were in the new Christian church calling to “Gypsy” and trying to get her under control. Shea fired at her with a pistol several times, but the bullets did no harm except to make her mad. For a couple of hours the elephant was master of the situation in that section of the city. She seemed to pay very little attention to home folks , but a number of times indicated a very keen desire to get hold of some of the circus crowd. They seemed to fear her more than anyone else, probably because they knew her better and they were careful to keep out of her way. Especially is this true of Barney Shea, her former manager, who stated that she had old grudges against him that she would never forget. 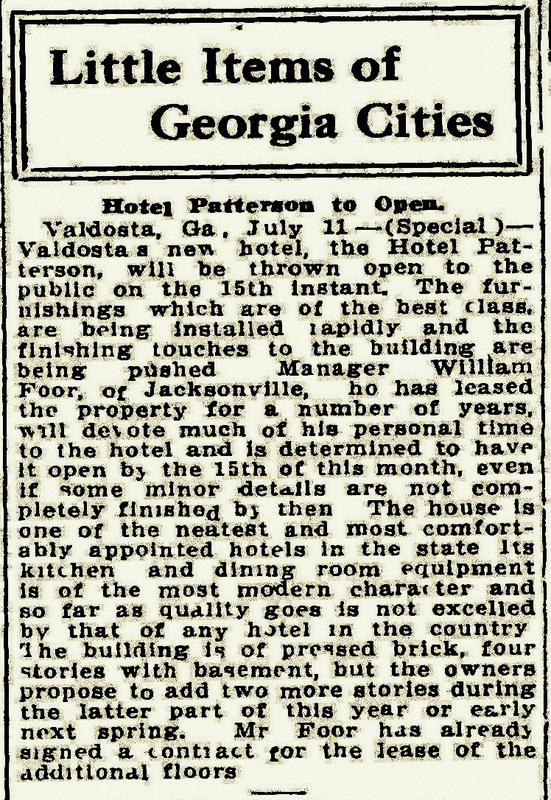 After an hour or two spent in promenading up and down the side walk in front of the Valdes Hotel and the new Christian church, Gypsy turned up Toombs street in a full gallop and as far as the eye could reach under the swinging electric lights her huge form swayed along with the alertness of a rabbit. Her steps by actual measurement were eight or nine feet each. She followed Toombs street to the vacant lot beyond the residence Mr. B. H. Jones when she cut across to Patterson street and went on to the park. The Big Brute at Pine Park. Then Chief Dampier and a large posse followed her to the park for the purpose of killing her, as she had proven herself entirely unmanageable and her owner, Mrs. Harris, had stated that she could not rest until she was sure the brute was dead. Her former keeper Shea got in the stand over the State Fair office and called her to him. She was in the rear end of the fair grounds but she answered his call. Chief Dampier and his posse were on top of the ticket office. The big beast walked up within fifty yards of them and stopped. The moon was behind the clouds and only a dim outline of her could be gotten. The chief drew his Krag-Jorgensen rifle and fired at her two or three times. The wounds were evidently painful, but not fatal to her. She gave one shriek and started on a full fun toward the fence in the rear of the grounds. She found a plank off and, with her huge trunk, brushed away a panel or two of the fencing like it was a row of tooth picks. She took the cross road toward the Cat Creek road and turned up that to Cherry Creek. It was then nearly four o’clock Sunday morning. Chief Dampier and his posse followed her for some distance and then returned to the city get lunches, secure horses and wait for light to dawn upon the scene. The Chase Toward Cherry Creek. By day light, the chief and his crowd were ready to go on the hunt again. 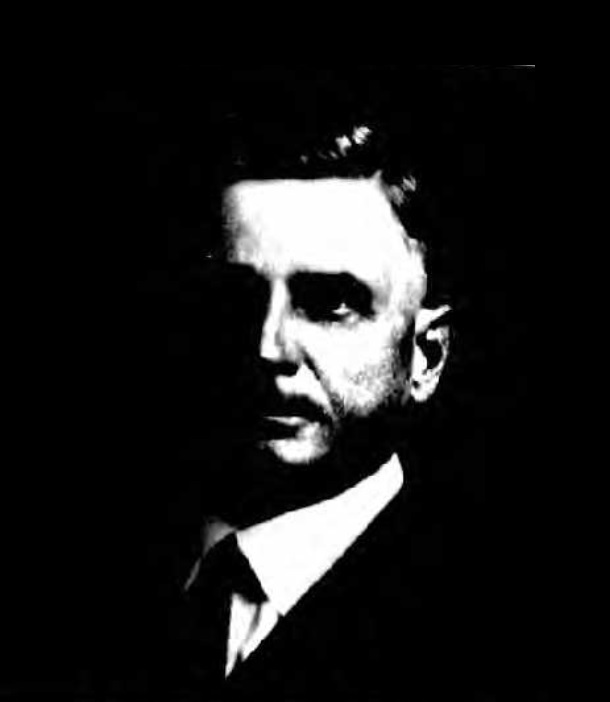 His posse consisted of his first lieutenant, Mr. M. A. Briggs and Messrs. James Gates, D. A. Sinclair, Lawrence Walker, Roy Hightower, Dave Roberts and one or two other parties. Mr. Briggs and Chief Dampier were in a buggy, while the other parties were on horse back. They left the city about five o’clock and followed the big animal out toward Cherry Creek on the Nashville Road. At several places they saw where the elephant had stopped in the road and had stood there some time, the impression on the ground looking as if she had lain down. The first sight of t.he big mountain of flesh and blood was near Cherry Creek and all came to a halt. The elephant, blind in one eye, was standing across the road with his good eye turned toward the city evidently watching in that direction. Her big body was swaying to and fro after the manner that elephants sway themselves when standing still. When she caught a view of the crowd she turned toward the north and started off in a rapid walk. The parties lighted and started in pursuit through the woods. The elephant finally came to a stop and Chief Dampier ran around to her side, taking a position probably seventy-five yards from her. The excitement of the chase, together with its fatigue had made him nervous and he was afraid to try and fire at her without taking good aim. The chief got a good rest for his weapon on a fence and took deliberate aim at her head. The Krag-Jorgensen rifle cracked with a sharp “ping” and the big brute fell to her knees and then over on her side. One shot had done the perfect work of destroying her life and when the parties reached her she was nothing more than a huge bulk of inanimate flesh. Chief Dampier fired one more shot into her head and other members of the party fired two or three times from their Winchesters and pistols. An examination of the death-wound showed that the bullet entered her temple and went probably three feet deep in her head. Another shot from the Krag-Jorgensen rifle had gone entirely through her neck. The Winchester shots had only entered an inch or two and had probably done no more than tickle her. 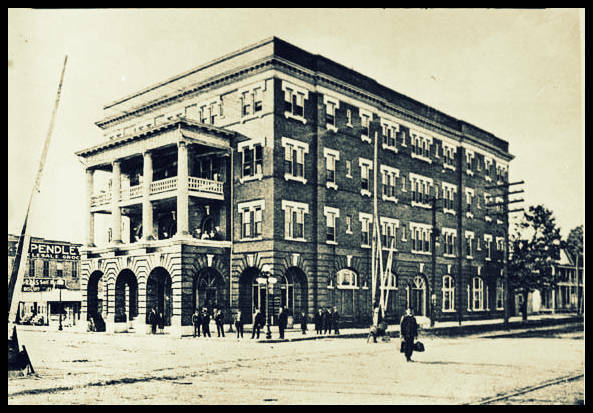 Chief Dampier and his posse returned to the city and reported the death of the elephant, and the announcement came as a great relief to the circus people. They had been uneasy all night long and were really glad to know that the great brute had been killed, even though it was a big financial loss to them. All day Sunday large crowds went out on the scene of the killing and scarcely anything else was talked about on the streets. The tragedy of the night before and the excitement incident to the chase after the big animal made it the most sensational event that Valdosta has ever known. Burial of the Dead Keeper. The body of the dead keeper, O’Rourke, was carried to Ulmer’s undertaking rooms and prepared for burial. It was found that several of his bones were broken and the body was badly bruised. It was placed in a very fine casket, bought by Mrs. Harris, owner of the Nickel Plate shows, and was buried in the city cemetery Sunday afternoon at four o’clock, the services being read by Mr. J. Duffy, of the Catholic church. The hearse was drawn to the cemetery by six beautiful white horse and all of the circus people, together with many from the city, attended the funeral. O’Rourke, it is said, had been with the circus for a number of years and had always managed the elephant. He came from San Francisco, though his family resides in New Orleans. It is said that he came near losing his life once or twice under “Gypsy’s” huge form, but was rescued. It is also said that several times, while he was intoxicated, the animal had picked him up and placed him in the car, and that on other occasions she has lifted him back on her head when he had fallen off. The animal was very docile at times, but on other occasions she has been perfectly unmanageable, having been sentenced to death a half dozen times and each time given a lease on life because the means of killing her were so hard to obtain. The body of the elephant was buried a short distance from where she fell dead Sunday morning. A half dozen horses were used to drag the remains to the grave, but they were unequal to the task and the body was finally cut to pieces with axes and moved a part at a time, four horses being used for the task. The dead elephant proved to be a drawing card for hundreds of people from this city, as well as the surrounding country. It is estimated that fully three thousand people visited the place where she was killed to get a view of her huge carcass, many of these walking six or seven miles to see the sight. Mr. T. G. Powers, of the Harris Shows, one of the animal trainers, was formerly in charge of “Gypsy” and knows her history as well as any other living man. He stated to a TIMES reporter yesterday that the animal was about sixty-five years of age and that she was among the first elephants ever brought to this country. She was imported by the O’Brien circus, which travelled through the country in wagons in 1847. She has been owned by nearly all of the big shows in the country, each one of them disposing of her on account of her temper, though at fabulous prices owing to her wonderful intelligence. Traits of the Big Animal. Mr. Powers stated that she had killed a half a dozen keepers in by-gone years and in each instance she had delivered the death blow only when she had every advantage of her keeper. Like all other elephants, she never forgot a kindness or an injury. She would harbor an unkind act for years and then avenge it after the one who did it had forgotten all about it. Last year, in Chicago, she ran amuck and was conquered by Mrs. Harris, a delicate, frail little woman, who had nerve enough to rush at her with a pitchfork and defy her. On another occasion she would have killed the same woman had not O’Rourke, who was killed Saturday night, run to her rescue. Mrs. Harris remembered this act when she gave an order for a fine casket and for the dead man to be given a decent burial. Gypsy is probably the only elephant of her size that has ever been killed by a rifle ball, and her death is a great advertisement for the Krag-Jorgensen army rifles, as well as for Chief Dampier who fired the fatal shot. Only a could of weeks ago on of the Barnum Elephants was carried twenty miles to sea out of New York, and three or four tug boats were used to hang her and sink her remains into the sea. The Story Will Live for Years. The killing of an elephant in the woods near Valdosta will be a story which will be told to generations yet unborn and it is highly probable that the veracity of many a truthful man will suffer from having repeated the tale. Even now, it is almost hard to believe, but the bones and white ivory tusks will form relics that will be kept for years by many who desire to keep such trophies to substantiate the fact. There has been some talk of saving the skeleton of the big animal and mounting it for exhibition in this city. If such a thing can be done, the people of Valdosta can afford to pay a good price for it. The death of Gypsy has given Valdosta more publicity than anything that has ever happened here, as there is hardly a paper in country that has not printed the story of Saturday night’s chase and its final results. Infuriated Beast Tramples and Then Rolls on James O’Rourk’s Body. Huge Animal Then Becomes Crazed After Shots Fired Into Its Body at Valdosta and Escapes. Found at Daylight and Killed. Valdosta, Ga., November 23. _(Special.) Gipsy, the huge performing elephant of the Harris Nickel Plate Show, became unmanageable after the performance in this city last night and killed her keeper, James O’Rourk. Another member of the show was also injured in endeavoring to capture and chain the infuriated animal. The show people lost all control on the elephant and after terrorizing a goodly portion of the people on Toombs street, she made her escape to the country, where she was followed and shot to death near Cherry Creek, 6 miles north of the city, after an all night chase. The mad creature’s escapade created intense excitement, and although it occurred after 12 o’clock at night, a large crowd was attracted to the scene. The elephant went through her usual performance in the ring in an apparently docile manner, but became unruly before the tents were struck. It was the last performance of the season, the show going into winter quarters at Pane park, near the city. After the show O’Rourk started with the elephant to the park, riding on her head. He is thought to have been under the influence of whisky and is said to have left the show ground scolding and prodding the already maddened creature. Near the Baptist church the keeper fell off the elephant, striking the ground almost in front of her. All the evil in her huge body seemed aroused when the man struck the ground and before he could make a move to save himself she placed her ponderous feet on his body and crushed his life out. She knelt on the body and then rolled the insensible and dying man along with her trunk for 75 yards. Only a few people witnessed the killing, but a considerable crowd soon gathered. Other members of the show attempted to secure and chain Gypsy, tossed the dead keeper’s body aside and went to eating the grass along the side of the street, A former keeper, to whom the animal once seemed greatly attached, called her name several times and went up to her. With rare cunning she allowed him to approach within arm’s length, when she threw her trunk out with lightning rapidity and knocked him half across the street, afterwards continuing her way out to the northern part of the city. A crowd followed her out to the park, where an effort was made to kill her. Several shots from pistols and a mauser rifle were fired into her body, but their first effect only seemed to enrage her, and with vicious lunges she scattered the crowd, and then mashing the park fences made her escape. The pursuit was kept up but the crowd lost sight of the huge creature in the dark. She was easily tracked however, and a number of places were found where she had lain down, the shots from the rifle evidently having begun to take effect. About daylight the crowd came up with the sorely wounded elephant 6 miles from town, and another shot from the mauser rifle in the side of the head rolled her over dead. O’Rourk, the dead keeper is said to have been from New Orleans, though his people live in San Francisco. He had been with the Harris show for ten or twelve years and had charge of Gipsy for the greater portion of this time. The elephant was one of the largest in the country and weight about 12,000 pounds. She had a bad record, having killed ten men previous to her break last night. She was splendidly trained, and notwithstanding her unenviable reputation was a very valuable animal. The Harris show is said to have refused an offer of $6,000 for her. Mrs. Harris, the owner of the show, begged that Gipsy’s life be spared, but is said to have expressed herself as greatly relieved when informed of the elephant’s death this morning. O’Rourk’s body was interred at the city cemetery this afternoon.